Read our blog on the need for a fresh agenda for advancing women's rights and gender equality in turbulent times. Re-telling the story of women’s back-breaking lives in India, Nepal, Rwanda and Tanzania. Beki Aby is a leader in the LGBT community in Ethiopia. In 2013 he co-founded DANA Social Club, an informal collective that advocates for LGBT rights and provides members with support and information. Cheryl Overs, at the Institute of Development Studies, interviews him about the situation in Ethiopia which to date has not been ‘on the radar’ of international organisations and activists. The All-Party Parliamentary Group on Global LGBT Rights (APPG LGBT) has published its first wide-ranging report on the UK Government’s thinking and their proposed activities to address a complex subject. Stephen Wood draws out some of the promising developments and highlights areas where we need a further push for clarity and practical action. We are delighted to announce the new Gender, Sexuality & Faith toolkit, a free resource to support faith leaders and communities working to promote social justice in relation to gender and sexuality. It includes information on Terminology, Key issues, Case studies and Activities, developed as a joint initiative with Sonke Gender Justice, the Wits Centre for Diversity Studies and the Institute of Development Studies. This blog post by Kay Lalor explores the recently published IDS Edited Collection and why the context of the law matters to the lived experiences of criminalisation and discriminatory practice, in relation to gender, sexuality and social justice. Sexual and gender justice may refer to the law but this is far from all it encompasses. 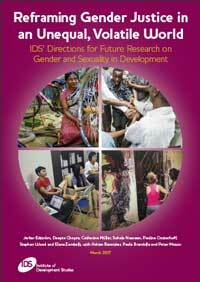 A new Edited Collection from IDS entitled Gender, Sexuality and Social Justice: What’s Law Got to Do with It? 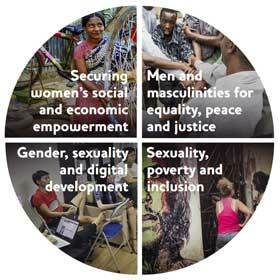 calls for ‘other ways of thinking’ about how to advance sexuality and gender justice.